oh my god ….. is beautiful!!!!! Really nice set-up ! Since I have seen this video in game, I was looking for such a making of. Thank for bringing us part and fragment of your work, even when it has been released ! I like the way you give us the tools to dissect and understand your own work, each time. This is really fantastic! The dance-sequence of Fatale is my favourite part in the game, but it’s very good to see how things develope… THX! For me this is the most interesting (and magic) thing in the world: how to make a “dream” out of a thouhgt, a real image (…or a video). THX! When was the last time I heard the word Rotoscoping? Probably when Jordan Mechner was creating The Last Express around 1997! While the results were incredible, it must have meant a lot of hard work for Laura Raines Smith, capturing all those intricate movements in detail. There’s something to say for hand-made animations, though. 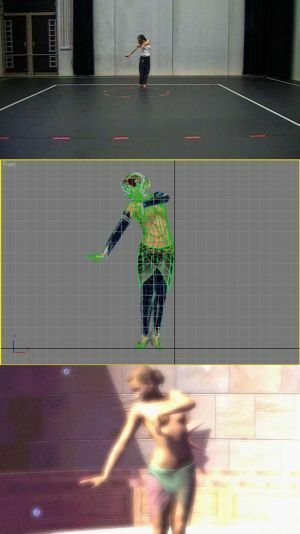 I love motion capture, when done well. But the small decisions made by an animator can also be very interesting. Rotoscoping, though a bit time consuming, isn’t as hard as it looks. Once you get the pelvis in the correct orientation and position, you plant the feet, then work your way out. I would key the whole body (every animatable part) about every 5-10 frames then go back when the sequence was done a delete keys that ruined smooth curves. Last, I made a hand/finger posture library and pasted them in. I could have used a few more weeks for polish but I ran out of time…and I had to do things like grocery shop and laundry. Glad you all enjoyed it…looking forward to working with TOT again soon! Wow. When I saw the dance I kinda figured there was a real dancer for reference (great dancing, too) but I thought it was motion capture. Wouldn’t have thought it was done by hand. You guys rock! And we with you, Laura! Pure and simple genius. On behalf of all us dancer-types, you have shed a little more light on what we do, and a big Thanks is in order. I want to learn The Dance and teach it to my students. Hehe. It would be great to see this danced by several people simultaneously. This makes me so many kinds of happy. Beautiful, all of it. The music, the choreography, the animation, the execution, all of it. Beautiful. This will also be immensely useful when I do set out to learn the dance – thank you! Just a curiosity: did Fahnette do some “inner” martial arts in the past, like Thai Chi?